Home � Magic Kingdom , News and Announcements � New Fireworks Dessert Party Now Offered At The Magic Kingdom. New Fireworks Dessert Party Now Offered At The Magic Kingdom. For a limited time the folks at Disney World are offering a new way to celebrate at the Magic Kingdom. 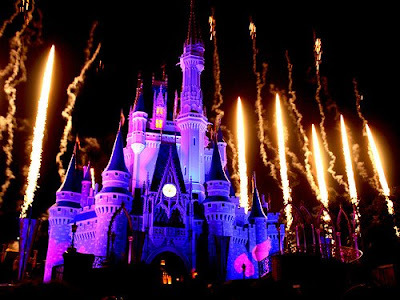 They have combined two of the best things about a day at Disney World: Dessert & Fireworks into a special experience at the Magic Kingdom. The new Magic Kingdom Fireworks Dessert Party begins an hour before the fireworks show time with a self-service buffet featuring a wide variety of sweets and beverages. When the spectacular "Wishes" fireworks presentation begins they have a special reserved viewing area to take it all in. This limited seating party and fireworks viewing will take place nightly at the Tomorrowland Terrace Noodle Station. Cost is $17.99 (age 10-up) and $9.99 (ages 3-9). You must already be admitted to the Magic Kingdom to participate and park admission is not included. This special party will first be held on June 23rd (now!) and run through Aug. 28th, 2009. Note: Photo is by Andy Castro. 0 comments to "New Fireworks Dessert Party Now Offered At The Magic Kingdom."